Utah Gov. Mike Leavitt, whose nomination to head the Environmental Protection Agency has become embroiled in presidential campaign politics, appealed to senators Tuesday to take a close look at his environmental record. As an example, Leavitt cited his role in helping improve air quality in the Grand Canyon through a regional commission trying to beat a federal deadline for taking over the task. "This experience taught me that enforceable national standards can be a catalyst to bring parties together, but national standards work best if participants are allowed to use innovative neighborhood strategies," Leavitt said in testimony prepared for the Senate Environment Public Works Committee. He also described the state's cleanup of groundwater contamination at the Kennecott Copper Mine, the largest mine-related water reclamation project in U.S. history. "It was accomplished without a dime of Superfund money and in a fraction of the time it would have taken if it had become a Superfund site," Leavitt said, referring to EPA's nationwide toxic waste cleanup program. "It was a great collaboration, and it occurred because well-meaning people (industry and regulators alike), joined together to solve a problem in a cost-effective and timely way." Among the questions Leavitt was expected to encounter was why he fought so hard to build a highway north of Salt Lake over objections from the EPA, which argued it would damage delicate wetlands and bird habitat. Utah's Republican senators, Orrin Hatch and Robert Bennet, appeared in support of Leavitt. "Utah knows Gov. 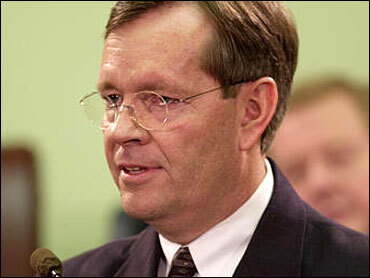 Leavitt took a clean, beautiful and strong state and made it cleaner, more beautiful and stronger," said Hatch. He also urged "critics of the president's environmental policy" to be "fair and not use the nomination of Gov Leavitt as a soapbox to castigate our chief executive." Bennett predicted beforehand the hearing would be unpleasant. "The critics will take it as an opportunity to attack President Bush. They'll use (Leavitt) as a surrogate on the environment, but the votes are clearly on the Senate floor to confirm him," Bennett said before the hearing. Two senators contending for the Democratic presidential nomination — Joe Lieberman of Connecticut and John Edwards of North Carolina — each have threatened to use parliamentary devices to prevent Leavitt from taking office, citing their opposition to Bush administration environmental policies. Lieberman didn't attend, because he was campaigning in California. Sen. Hillary Rodham Clinton, D-N.Y., was the first to threaten to block the nomination because of an EPA inspector general's report that found that White House officials persuaded the agency to tone down its assessment of possible health threats from asbestos, soot and PCBs after the World Trade Center collapse. Utah-based environmental groups maintained Monday that Leavitt weakened environmental regulatory agencies, discouraged public input and overlooked scientific data. National activists campaigned against him on the Internet, using a "Love It or Leavitt" poster, petition and game and selling T-shirts and caps. Bennett said Leavitt was "being very well-coached" by the White House and has an advantage in that several senators who served as governors know and like him, including Democrats Bob Graham of Florida and Thomas Carper of Delaware, both members of the Environment and Public Works Committee. The hearing's dynamics reflect congressional Democrats' strength on the environment. Asked in an August poll for Newsweek who would do a better job on the environment, 53 percent said Democratic leaders in Congress, 29 percent said President Bush. Only a simple majority on the committee is required to send Leavitt's nomination to the full Senate. With 11 Republicans, eight Democrats and one independent on the panel, there was little doubt he would win the committee's approval. A single senator can put a hold on a nomination, preventing it from being scheduled for a floor vote.